Today’s incredible dental advancements make it possible for smile-challenged adults to achieve the gorgeous, straight smiles they’ve always dreamed of, without suffering with traditional braces. Of course you would. And now you can, with Dr. Paul Mathew’s artistic application of instant orthodontics. Today’s incredible dental advancements make it possible for smile-challenged adults to achieve the gorgeous, straight smiles they’ve always dreamed of, without suffering with traditional braces or even the more discreet but time consuming Invisalign® teeth straightening system. 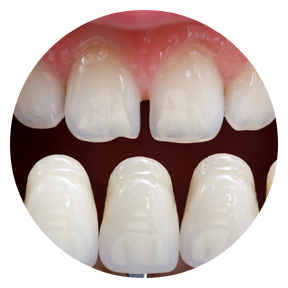 Porcelain veneers are very thin shells of fired porcelain affixed to the front surfaces of the teeth. Veneers look and feel natural and allow Dr. Mathew to change the length, width, color and shape of one or more teeth, restoring their natural attractiveness. Porcelain veneers resist staining and give you a white, bright straight smile that lasts a very long time. When instant orthodontics can change your smile instantly, why go through life with a crooked smile, or endure the discomfort of braces? Porcelain veneers begin with Dr. Mathew taking an impression of your teeth. The impression goes to a dental lab where a ‘wax up’ is created. This is a wax model of your new smile. Together, you and Dr. Mathew review the wax up, making changes as needed, and the lab proceeds with creating your porcelain veneers. Dr. Mathew then prepares your teeth and fits temporary veneers and, when the new veneers return from the lab, the temporaries are removed and your beautiful new porcelain veneers are bonded to your teeth. Porcelain veneers are beautifully translucent and look so much like your natural teeth, everyone will notice your beautiful new smile, but no one will know exactly what you’ve done. Don’t wait another day to change your smile and your confidence with porcelain veneers. The procedure is simple, painless and affordable with a variety of financing options designed to suit every budget. Please contact Artisan Dentistry today, and begin a new outlook on life tomorrow with high quality, custom-created porcelain veneers by Dr. Mathew. Learn how to transform your crooked, uneven smile to a beautiful, straight smile in only 3 dental visits, and without braces.